Francesca Bolt – Sports Performance Nutritionist! Francesca, tell us a little more about your sports nutrition/fitness and wellbeing focus. How you got started, and how you stay motivated? I have always been big into keeping fit and healthy. When I was younger I played lots of team sports, then progressed on to longer distance running and cycling and now my primary focus is Powerlifting. 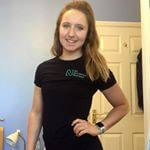 Through studying Sports Science at Loughborough university I developed an interest in sports nutrition, and I used the principles I was learning to manipulate my own nutrition in order to support my training. I fell in love with the way strength training and correctly fuelling my body made me feel, perform and grow! I have now been powerlifting for 3 years and have competed numerous times, most recently placing 5th at nationals and qualifying for the world university championships with my team. This year I have also begun my masters in Sports Nutrition at Loughborough university, as well as taking on the role of Head of the Powerlifting team. Alongside my studies I also work as a nutrition coach for No Nonsense Nutrition, working with clients in our group coaching programs and 1-1. So how did you discover our #ProteinCheese?! I first discovered Eatlean cheese around 3 years ago when the company was just starting out. I was lucky enough to be sent a sample in the post, and the rest is history! I was very excited to have the opportunity to become one of the female Eatlean ambassadors because it is a product I have used for ages and would highly recommend regardless of being an ambassador! I love creating and sharing high protein and tasty recipes with other likeminded foodies in the community. I am a big advocate for using a dietary approach that is inclusive and flexible, and Eatlean cheese means that cheese is back on the menu regardless of whether your goal is weight loss, muscle gain or just eating to support and active lifestyle! In your view, how can Eatlean #proteincheese help in terms of sports performance and nutrition? The original Eatlean cheese is higher in protein and lower in calories and fat than all other supermarket cheeses. This makes it a great way to add in extra protein to your diet, without adding a ton of extra calories! Having protein in your diet is important as it is involved in nearly every body function, from helping to build lean muscle mass, maintaining hormone function and supporting the immune system. A high protein diet will also help increase satiety meaning you stay fuller for longer! I put Eatlean on pretty much every meal! But my current favourite has got to be using the spreadable cheese to make a creamy pasta sauce and then baking the pasta dish in the oven with more eat lean sprinkled on top. Cheesy HEAVEN!